I decided that I wanted something a little different for my front door this fall. Something a little leaner and cleaner than an overly fussy fall wreath. 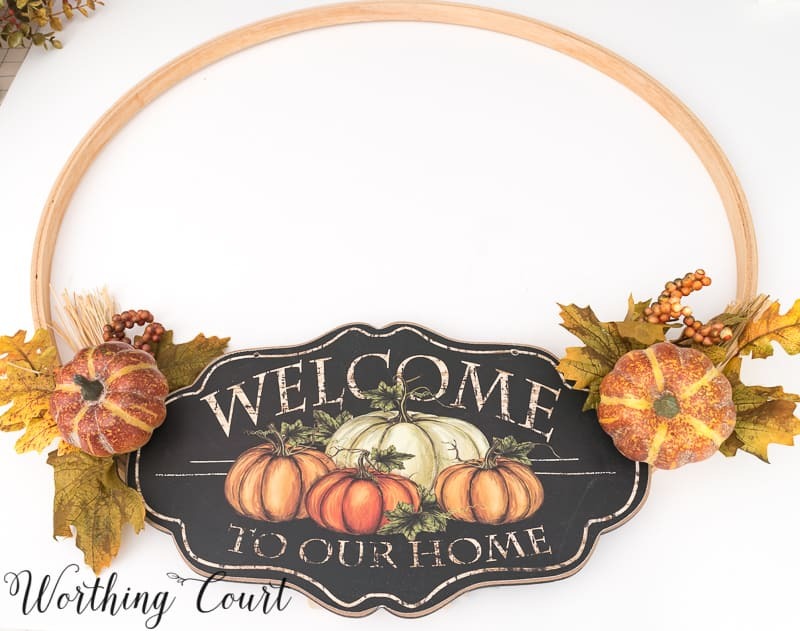 I’ve had my eye on lots of different types of embroidery hoop wreaths for quite a while and when I ran across a cute fall plaque, I knew just what I wanted to do! Let me show you the step-by-step directions for how to make one for your door. 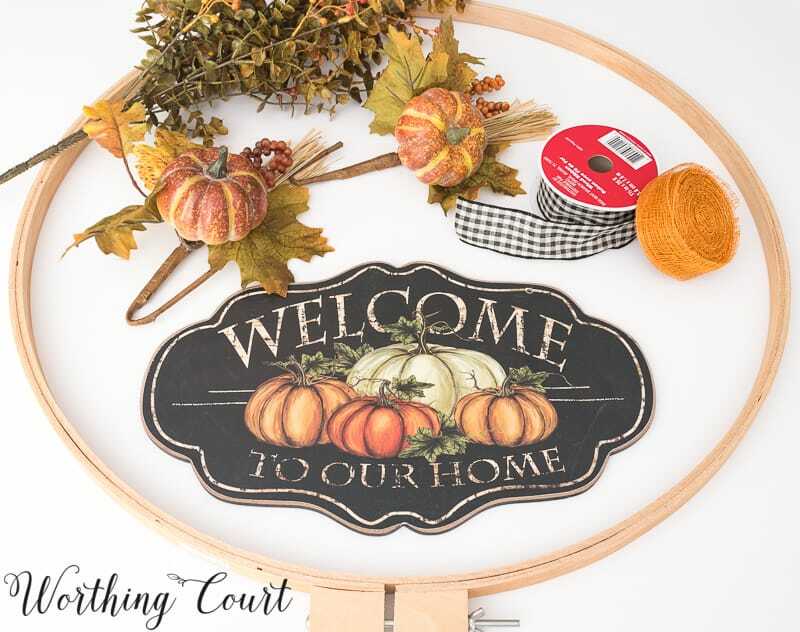 Embroidery hoop – My wreath is 23″ in diameter. Decorative plaque – I found mine at Hobby Lobby. Hot glue the decorative plaque to the clamp part of the embroidery hoop. Be sure to be generous with the amount of glue that you apply. Allow the glue to dry before proceeding to the next step. Hot glue a fall pick to the back of each side of the plaque. I had to bend the stems on my picks to get them in the proper position. Hold the picks in place until the glue is dry. Snip pieces from the floral bush, turn the stems so that some of the ends are facing one way and other ends are facing the opposite way. Wire the stems together with green florists wire. Look closely and you can see where my stems are wired together in the middle. 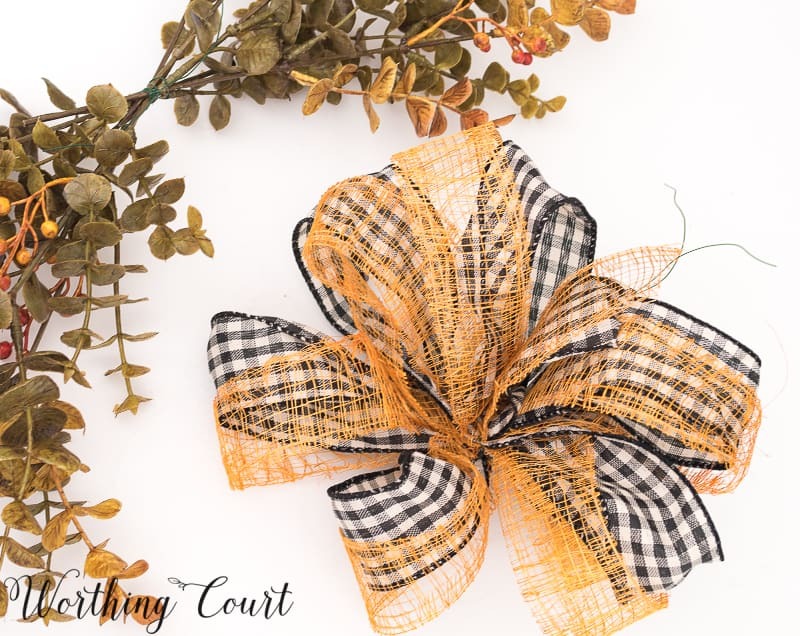 Make a bow using two different colors of ribbon that coordinate with the other decorations on your wreath. Click HERE for an easy to follow tutorial for bow making. 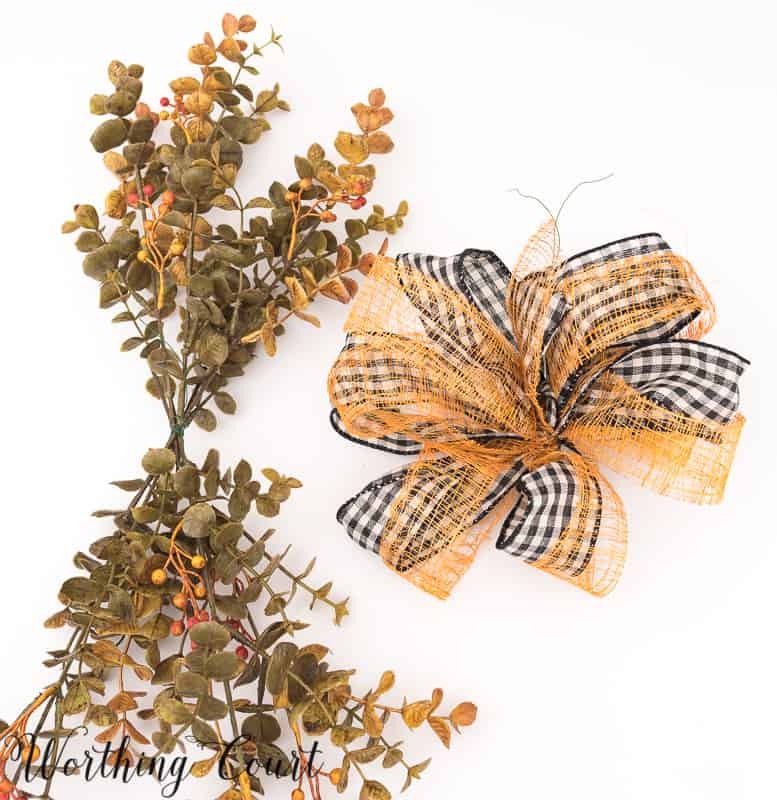 When tying the bow together, be sure to leave the ends of floral wire long enough to secure the bow to the pieces of the floral bush that you wired together. Secure the bunch of faux foliage and the bow to the hoop with floral wire. Hang the wreath on your door and enjoy! My wreath is actually hanging from a suction cup hook. I layered two lengths of ribbon together and looped it around the hoop to make it appear that the wreath is hanging from ribbon and to help cover the suction cup. 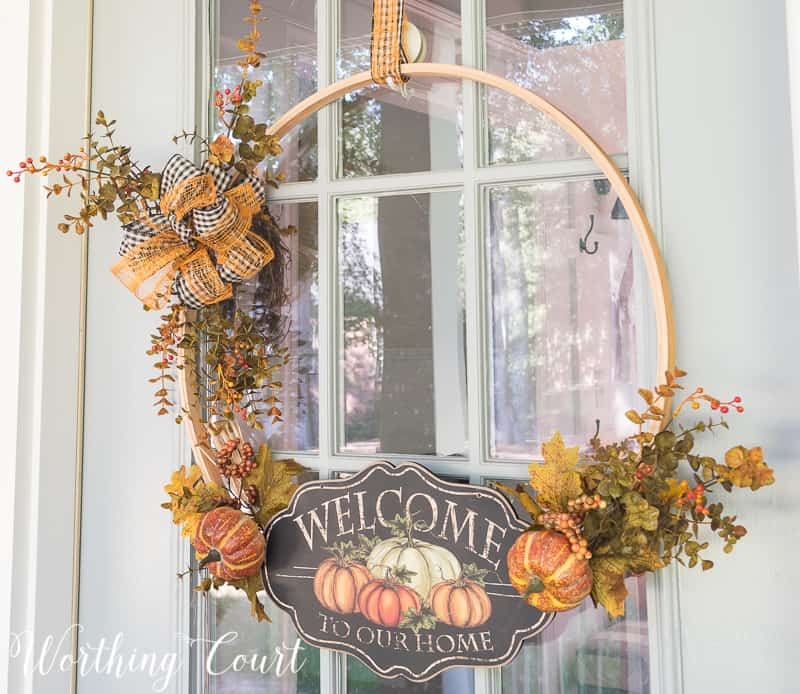 I adore this wreath and love how it blends with the rest of the decor on my front porch this fall! Click HERE to take a closer look at my porch. I’ve teamed up with several of my bloggy friends to bring you lots of DIY ideas for fall decorating! Click on the name of each blog below to see their projects. This is beautiful, Suzy! I just adore the ribbon you chose. I haven’t made any wreaths yet with an embroidery hoop but I think I need too after seeing how lovely this one is! Your wreath came out beautiful, I really love how you used the ribbon to hang it! 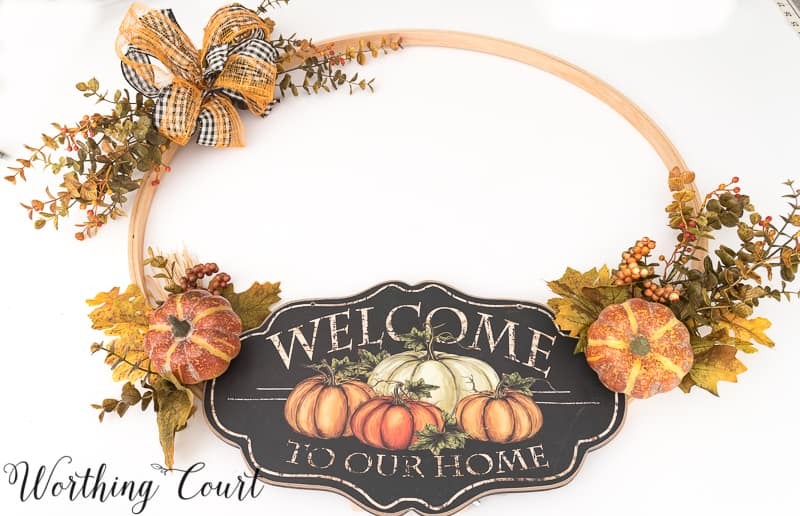 Love this wreath – off to hobby lobby! This is so so beautiful! I absolutely love this! Great job! This is so pretty Suzy! 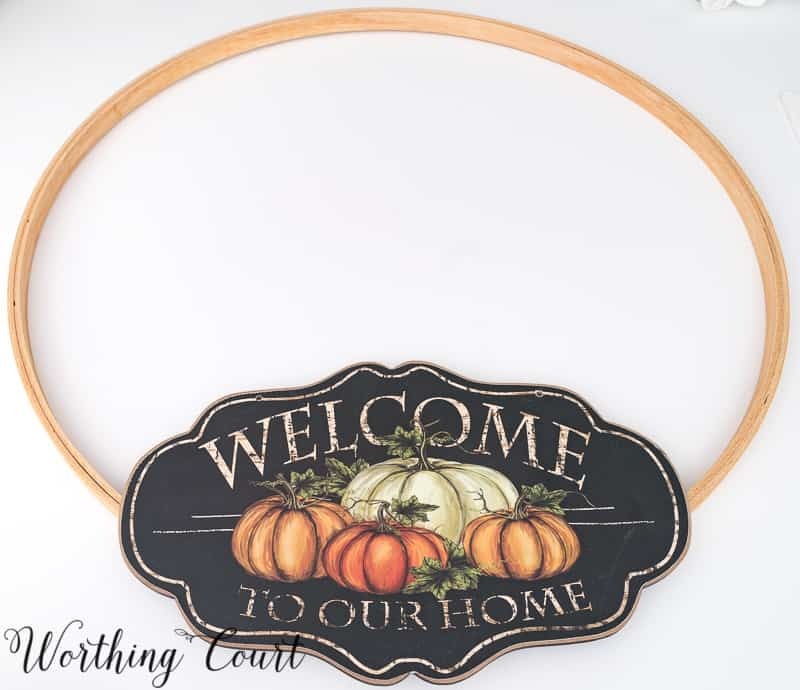 I love how you added the sign to your embroidery hoop (super clever). I am also obsessed over your front entrance…HOW GORGEOUS!!!! I agree, I am going to Hobby Lobby after work! It is time to change the wreath on my front door, thank you for sharing!!! The idea is great! 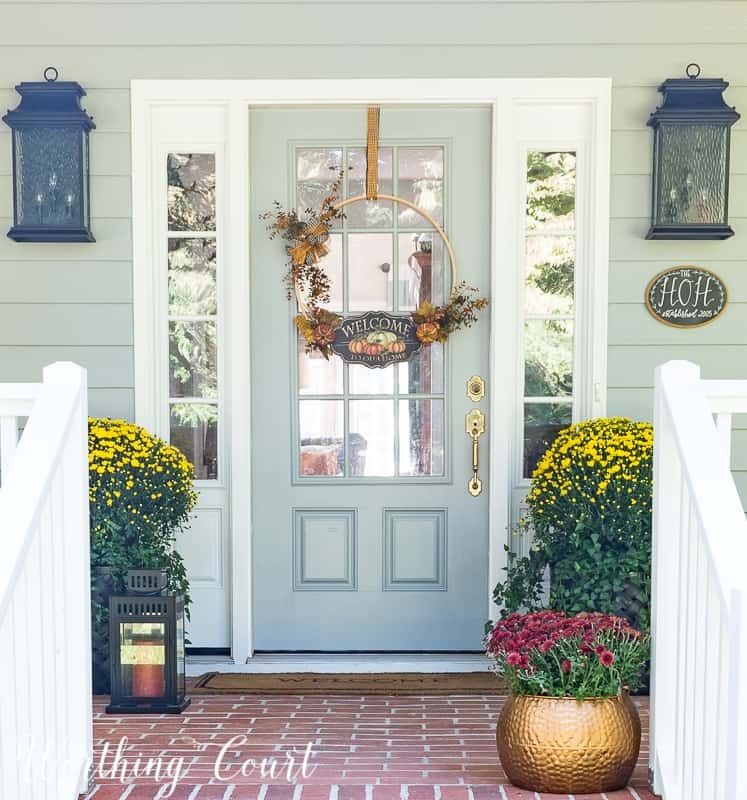 I think it is clean and simple looking, just the right touch to compliment the rest of your fall porch decor!! This is such a fun idea and so easy!!! Can’t wait to make on. Thank you for sharing your idea! LOve this !! Going to have to make one. Thank you fir the inspiration! I love this wreath , so simple yet elegant! The temperatures are actually dropping a bit here and I’ve bought a can of copper spray paint! 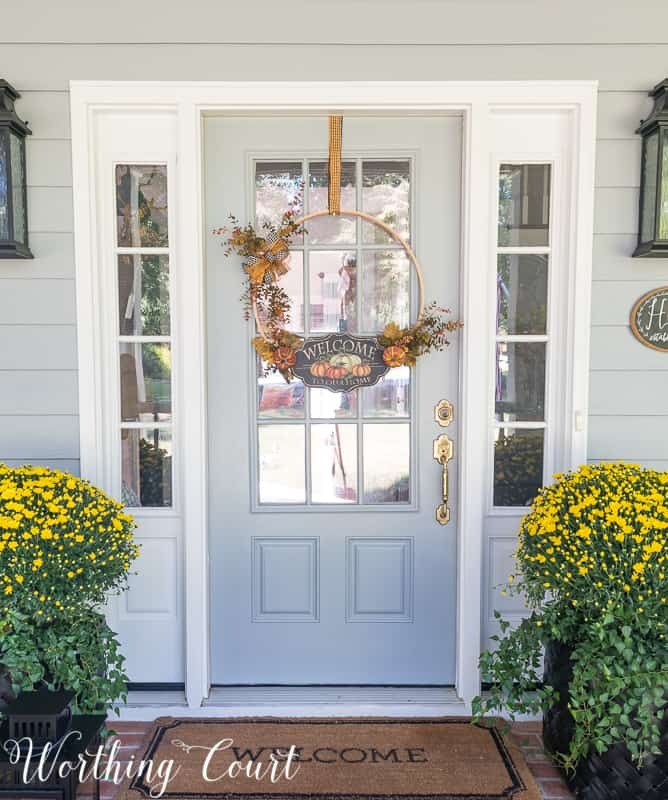 Love your front porch…great inspiration! This wreath is so cute! I like that it’s different from the other traditional wreaths. 1Your wreath is very pretty! But I wanted to let you know that I get an error (404) when I try to follow the Thistledown link. Thanks! Great idea! So easy to make too. Suzy, your wreath is just wonderful! I love the simple, clean look and your whole entryway is beautiful! Beautiful! I’ve been wanting to make a wreath using an embroidery hoop now I’m even more motivated. Thanks for sharing! Love it. The small plaque is what makes this wreath. I have an older hoop and now I know what to do with it. 🙂 Love your porch as always. Thanks for the inspiration. I have all the materials to make a wreath today! I love that!! You make the best things. I have been searching every chance I get I during every season for buffalo check ribbon. I just love the simplicity of this wreath. Thanks for sharing “how to” for those that love the make crafts..
Nice change from more traditional wreaths. 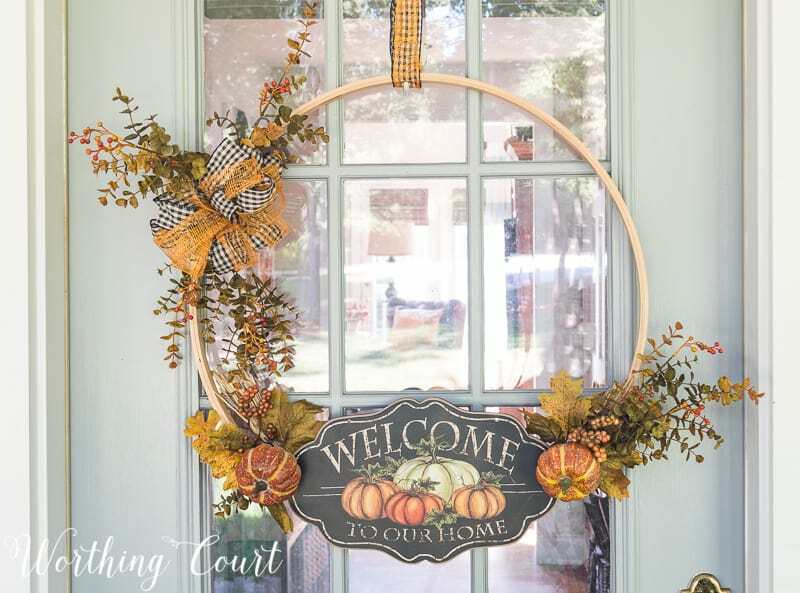 This wreath is sweet, and not so overwhelming as many recently have become! Seems lately people have been trying to “outdo” the neighbor! I like irs simplicity, and “negative space” … as we creatives call it, right!?! p.s. How about using black type for our comments, as we input them? I now have reading glasses because my stronger contact lenses blur my close vision, and I can barely read my own creations! This is so pretty, Suzy! I need to make one of these. It looks perfect on your door. Thank you for sharing this adorable project! The little welcome sign makes for a perfect focal point! I love this wreath. Simple yet makes a great impact!! I love the look of this wreath. It’s simple and beautiful and looks fantastic next to those bright yellow mums. Perfect Fall decor. Honestly, where do you come up with these beautiful ideas? They are always unique and so pretty:. Thanks for sharing your creativity. I love wreaths that are out of the ordinary. Thanks for the great ideas! What a unique Fall wreath! I love the simplicity and charm! Thanks for sharing! I absolutely love this wreath! I’ve wanted to create one using my oval vintage embroidery hoop & thanks to your wonderful tutorial, I’m doing just that! And, creating a cute bow also thanks to you! Blessings! I made one of these simple wreaths and I love it. So easy to do. Always fresh ideas that anyone can do. Thanks! I love the embroidery hoop wreath! I’ve seen them before but I guess my mind didn’t register how nice-looking they can be. Yours with the sign is perfect. I think I might have to make one! So I know this s is a little late but since I saw this post I have been wanting to make this wreath !! I have all the components and hopefully will be able to get this made tomorrow before my family comes fir the holidays! I can’t wait to try making a wreath like this. I would love to see different embroider hoop wreaths decorated for the different seasons. I have a smallish embroider hoop and think I’ll use it for inside my small apartment! How badly am I breaking the rules?! My “Fall” box is still in our storage locker but not for long!!! Everything else I’ll need is in there so guess what I’m going to do today! Your so good at what you do! Thank you for such a fun idea!! Good morning! I don’t think you’re breaking any rules at all! 😀 I love small wreaths displayed indoors. I did that very thing with a small Valentine’s wreath that I put together with supplies from the dollar store. Love the embroidery hoop idea. I’ve been looking at the hoops to use with my Grandmothers’ crochet she did when I was a child. I remember her trying to teach me to crochet and I did learn but lost interest; boy do I regret that now. I’m going to try your idea for my front porch. Thanks for showing us the instructions for the bow as well. I’ve done wreaths for many years but I’ve never mastered the art of bow making. I’m going to use your instructions and practice, practice and practice. I found your blog site about 2 weeks ago and I love everything about you!!! I loved your family room transformation. You did a wonderful change from traditional to farmhouse. Just beautiful. Love it!!! Thanks again for sharing your home with us and all your decorating ideas. Thank you so much for your sweet, sweet words, Jean! I’m so glad to “meet” you! My mom taught me how to both knit and crochet, but it just didn’t interest me either. Like you, I really regret that now.